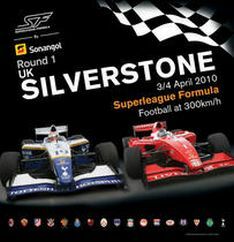 01.04.2010: After a long winter away, the shriek of V12-engined single seaters will reverberate around the Northamptonshire countryside this weekend as Superleague Formula by Sonangol returns for a new season at Silverstone. After a long winter away, the shriek of V12-engined single seaters will reverberate around the Northamptonshire countryside this weekend as Superleague Formula by Sonangol returns for a new season at Silverstone. The football-themed series features a raft of changes for 2010 – a five million euro prize fund, 12 rounds and new clubs to name but a few – but the same ultra-competitive, side-by-side excitement-fuelled racing very much remains. Indeed, Silverstone’s wide, high-speed layout offers the ideal opportunity to show off Superleague Formula’s Elan-built single seater in all its glory. Featuring push-to-pass systems and proving less-downforce-reliant than some of its contemporaries allows the entire field to run nose-to-tail. Throw in an entirely reversed grid for race two, which sees the faster drivers carving their way through from the back, and it’s not difficult to see why the championship has become the most thrilling in Europe. Not that it’s all about machinery. A world class driver roster has once again been assembled with the likes of ex-F1 stars Sebastien Bourdais, Robert Doornbos and Frank Montagny all confirmed for the upcoming campaign. Britain too will have high hopes of seeing a home victory thanks to last season’s top two teams Liverpool and Tottenham both featuring local talent, reigning league champions Liverpool having signed Jersey’s James Walker while Tottenham stick with their star from last season, Craig Dolby. With the two clubs locked in a fierce on-pitch battle to decide England’s final Champions League place, the duo are both aware of the opening round’s significance. James Walker, Liverpool FC: “I’m obviously really looking forward to my home round at Silverstone. I was quick there in Renault World Series last year, finishing second in the feature race and qualifying on the front row, and I think my driving style definitely suits the high-powered cars round a circuit like that. The home support is definitely going to help as well so I can’t wait. “The battle between myself and Craig is going to be good. I know him away from the track reasonably well but I haven’t yet battled with him on-track so it’s going to be interesting. He was very quick last year but I’m not sure how much experience he’s got around Silverstone so I’m going to get down to work during testing and make sure we’re in good shape for a strong weekend. Craig Dolby, Tottenham Hotspurs: “To be back in the car with Spurs again is exciting but to be at Silverstone is going to make it a very special weekend for me. Unfortunately I’ve not driven the Grand Prix circuit yet so I’ll find out what that’s like on Thursday. It’ll be a bit new to me but I’ll be giving it absolutely everything like normal and put on a good show for everybody. “It’s going to awesome for the spectators to hear those V12 engines fly around Silverstone and down Hangar Straight, that’s for sure! From a driving point of view, I think a fast and flowing circuit is going to suit me down to the ground and with the push-to-pass there’s bound to be some entertaining racing. I’m certainly planning on making a good start to the year. Testing is planned for this Thursday as drivers and teams re-familiarise themselves with their Superleague Formula machines, ahead of Friday’s free practice, Saturday’s qualifying and Sunday’s three races. As opposed to last season, the first two races will now last 45 minutes while points will also be awarded for those drivers competing in the Super Final, which features the top six points-scoring drivers from the day’s previous two races. A packed support bill will also be on hand this weekend, featuring the Dutch Supercar Challenge, SPEED Series, Grand Prix Masters, World Sportscar Masters, Caterham Superlight R300 Championship and CIK-FIA European Superkart Championship. In other news, Australia’s John Martin will run in the colours of Atletico Madrid this weekend while a deal to secure his future club is concluded. Maria de Villota will be back at the wheel for Los Rojiblancos from the second round onwards at Assen, meaning that 17 cars will line up at Silverstone. Duncan Tappy will become the third Briton to race on home soil this weekend after signing a one-race deal with Brazilian club Flamengo. Brush up on last year’s championship with ESPN’s 2009 Superleague Formula review tomorrow night at 22.30, before catching the opening round from Silverstone live this Sunday. ESPN: Sky 417, Virgin Media 529, BT Vision 34, Talk Talk 555, Freeview (Top Up TV) 34. PK Carsport staat voor een nieuwe uitdaging.